Cotton comes from the fiber on the outside of the seeds of a number of species of the genus Gossypium. Gossypium hirsutum is the most common commercial type of cotton. Other common commercial cotton species include arboreum, barbadense, and herbaceum. There are also a number of hybrids used commercially. Cotton has a refractive index along its length of about 1.56 to 1.59 and perpendicular to its length of about 1.52 to 1.54. It has a birefringence of up to 0.05 and a positive sign of elongation. Cotton is typically a twisted ribbon in appearance under the microscope but the frequency of the twists varies with maturity of the fibers, they species of fiber, and chemical processing of the fiber (Mercerization). 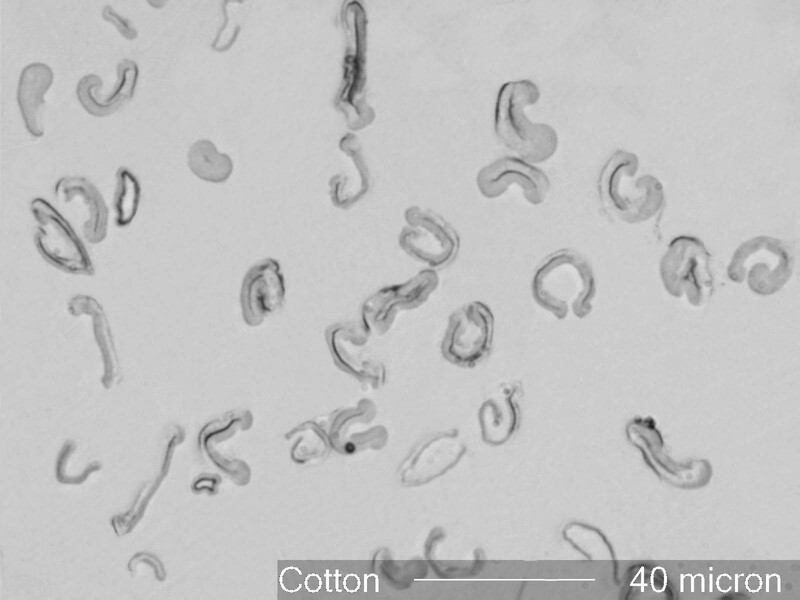 Mature cotton fiber of the species hirsutum has no extinction position. This property varies in other species.